294 • SHOPPING CENTER BUSINESS • May 2017 BRINGING LIFE THROUGH LIGHT S tudio Artefact, a 30-year old, Canadian-based design and décor studio, is well aware that the key to bringing con- sumers into a retail area and generating foot traffic is by cre- ating memorable shopping environments and experiential moments for visitors. In a commitment to supporting retail developers in this massive trend, Studio Artefact decided to make illumination the cornerstone of its designs. 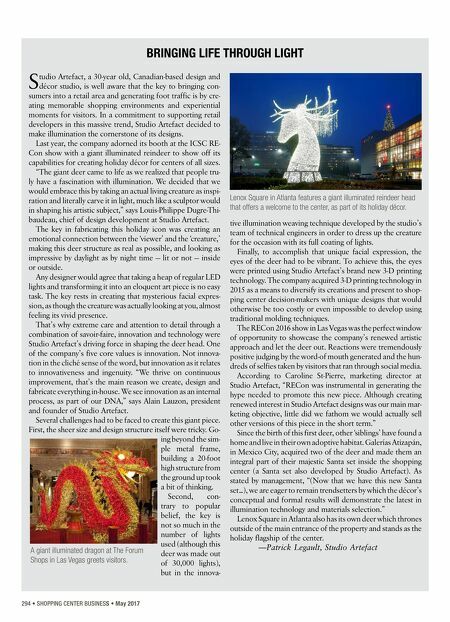 Last year, the company adorned its booth at the ICSC RE- Con show with a giant illuminated reindeer to show off its capabilities for creating holiday décor for centers of all sizes. "The giant deer came to life as we realized that people tru- ly have a fascination with illumination. We decided that we would embrace this by taking an actual living creature as inspi- ration and literally carve it in light, much like a sculptor would in shaping his artistic subject," says Louis-Philippe Dugre-Thi- baudeau, chief of design development at Studio Artefact. The key in fabricating this holiday icon was creating an emotional connection between the 'viewer' and the 'creature,' making this deer structure as real as possible, and looking as impressive by daylight as by night time — lit or not — inside or outside. Any designer would agree that taking a heap of regular LED lights and transforming it into an eloquent art piece is no easy task. The key rests in creating that mysterious facial expres- sion, as though the creature was actually looking at you, almost feeling its vivid presence. That's why extreme care and attention to detail through a combination of savoir-faire, innovation and technology were Studio Artefact's driving force in shaping the deer head. 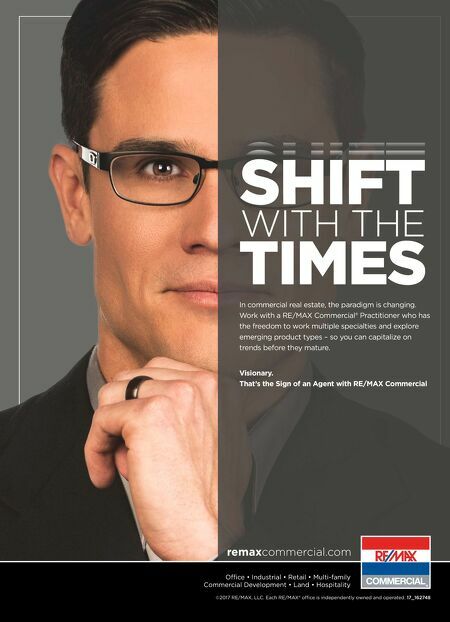 One of the company's five core values is innovation. Not innova- tion in the cliché sense of the word, but innovation as it relates to innovativeness and ingenuity. "We thrive on continuous improvement, that's the main reason we create, design and fabricate everything in-house. We see innovation as an internal process, as part of our DNA," says Alain Lauzon, president and founder of Studio Artefact. Several challenges had to be faced to create this giant piece. First, the sheer size and design structure itself were tricky. Go- ing beyond the sim- ple metal frame, building a 20-foot high structure from the ground up took a bit of thinking. Second, con- trary to popular belief, the key is not so much in the number of lights used (although this deer was made out of 30,000 lights), but in the innova- tive illumination weaving technique developed by the studio's team of technical engineers in order to dress up the creature for the occasion with its full coating of lights. Finally, to accomplish that unique facial expression, the eyes of the deer had to be vibrant. To achieve this, the eyes were printed using Studio Artefact's brand new 3-D printing technology. The company acquired 3-D printing technology in 2015 as a means to diversify its creations and present to shop- ping center decision-makers with unique designs that would otherwise be too costly or even impossible to develop using traditional molding techniques. The RECon 2016 show in Las Vegas was the perfect window of opportunity to showcase the company's renewed artistic approach and let the deer out. Reactions were tremendously positive judging by the word-of mouth generated and the hun- dreds of selfies taken by visitors that ran through social media. According to Caroline St-Pierre, marketing director at Studio Artefact, "RECon was instrumental in generating the hype needed to promote this new piece. Although creating renewed interest in Studio Artefact designs was our main mar- keting objective, little did we fathom we would actually sell other versions of this piece in the short term." Since the birth of this first deer, other 'siblings' have found a home and live in their own adoptive habitat. Galerías Atizapán, in Mexico City, acquired two of the deer and made them an integral part of their majestic Santa set inside the shopping center (a Santa set also developed by Studio Artefact). As stated by management, "(Now that we have this new Santa set…), we are eager to remain trendsetters by which the décor's conceptual and formal results will demonstrate the latest in illumination technology and materials selection." Lenox Square in Atlanta also has its own deer which thrones outside of the main entrance of the property and stands as the holiday flagship of the center. —Patrick Legault, Studio Artefact Lenox Square in Atlanta features a giant illuminated reindeer head that offers a welcome to the center, as part of its holiday décor. A giant illuminated dragon at The Forum Shops in Las Vegas greets visitors.